When the final siren rang out on Grand Final day of 2016, the majority of the footy world would have to agree that they had just witnessed one of the biggest underdog victories of the modern era. Staggeringly from a mere 7th position on the ladder, the plucky Western Bulldogs had made it to the Grand Final and what ensued was a complete and utter dethroning for minor premiers, the Sydney Swans. Celebrations followed and lasted for some time afterwards (I’m looking at you Libba! ), but in the hours after the win, a sudden realisation occurred amongst footy fans Australia wide… Off season was here. In the proceeding months, we were left to clutch at anything remotely footy related and all our Christmases came at once when the official trade period began. In what was arguably one of the most intriguing trade periods in years, it appeared Hawthorn was none too keen to be out of the spotlight, so they compromised and blew everybody’s minds by relinquishing two of their all-time greats in Jordan Lewis and Sam Mitchell. In the latter end of 2016, Smitch ventured west to start the tail end of his football career at the West Coast Eagles. In a move that was originally touted by former coach Alastair Clarkson, Mitchell decided that it was the right fit for himself and his family. It is also no secret that he has a close friendship with current West Coast Eagles coach Adam Simpson and the ability to help coach and mentor a younger Eagles midfield all attributed to his move to Perth. So, what does this mean for us Fantasy coaches? Let’s face it Mitchell is a certified proven gun! It’s hard to believe a player of his calibre slipped through to pick number 36 in the 01’ National Draft, however hindsight as we all know is a wonderful thing. In the last 6 seasons of top level footy, Smitch has posted yearly averages of 112, 101, 95, 92, 103 and most recently 99. In 2016 he started with a bang by smashing out five scores over 100 in his first five games, including a 146 against the Eagles, and a 130 against St Kilda. Regardless of whether he is involved in a win or loss he racks up disposals with apparent ease, ranking 14th in the competition for total disposals and 14th again for total kicks. Moreover, his ability to accumulate fantasy points doesn’t hinge on a specific skill and as such he can supplement a rare poor day at the office by tackling or marking his way to a respectable score. To put it simply, consider this, in 2016 Mitchell kicked absolutely no goals yet still averaged just under a ton. Quality. As a full-blown Eagles supporter who believes Smitch will be the lord and saviour in 2017, this pains me to write. However, the reality is that for the first time in 15 odd years Mitchell’s exact role is largely unknown. In years prior we’ve had a fairly good idea where Smitch would line up and who he had around him. We knew that although the likelihood of him being tagged was high, he’d still manage to make an impact in some way shape or form. We knew he’d attend copious amounts of centre clearances, we knew he float back and rack up few +6’s (mark and a kick), and we’d be comforted in the knowledge that around him stood some of the games greatest players, players who had just recently won 3 premiership cups in a row. Put simply, Mitchell knew his team mates back to front, and in a game where teamwork is paramount, knowledge of those around you is a powerful weapon. Another thing that may or may not put you off is the age factor. In the real world being 34 years old isn’t even close to being considered “old”, however in the AFL world anything over 30 and you’re tarred with a rather negative brush and the notion of stringing a full season together and avoiding any injuries is a long shot at best. Alas, age is but a number and as we saw last year with Mr Riewoldt some blokes just get better as the years go by. The tag that may or may not find his way to him scares me off a little too. I’m 2016 it was as though teams suddenly realised Hawthorn could be beaten if they shut down a major cog in their midfield. This resulted in a roller coaster season for the veteran, which included a run of putrid scores in round 6, 8, 9 and 10 (66, 74, 53, 88 respectively). 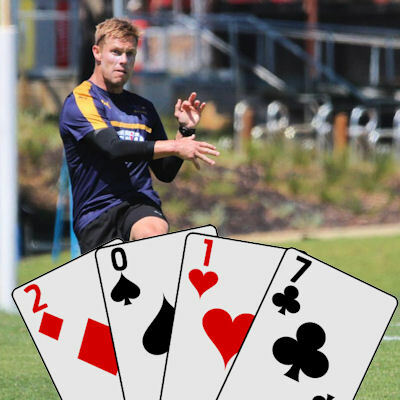 King– It seems strange not awarding Smitch Ace status this year but by no means does this mean he has diminished in value since we last included him in the deck for 2014. Don’t get me wrong, I’m his number one fan, however the change of team and the inevitable teething problems that often comes with it leaves me hesitant to award top honours at this stage. Of course, that sentiment may backfire and prove me wrong come round 1, but in the interest of non-biased reporting I must err on the side of caution. Fantasy is game game won by the brave and often the top 5% have taken a chance on a POD early and risen like cream to the top. In the perfect world, you’d pick him round one and watch as he seamlessly gelled into the West Coast midfield and along with fellow Brownlow medal winner Matt Priddis, pumped out consistent tons on his way to a career best, final year. Dreams can come true, right? Do you think the change of club in 2017 will help or hinder Mitchell's fantasy output? FOLLOW ME ON TWITTER: @leighroyDT for all things AFL Fantasy (and more). Got something to say about the deck? Use the hashtag… #DeckofDT. I’m not considering him, although I am considering the effect it will have on some of his new team mates. Will Smitch getting tagged free up Shuey to move into uber premo territory? Can Gaff push 105+ now getting more supply from his midfield? Will it help or hurt Pridda’s average? What effect will smitchell’s new player/coach/mentor role have on 4th and 3rd year players Sheed & Duggan and can they push their averages above 90+? Something to think about especially due to the lack of round 12 bye player options. I’m surprised no comment on the resting factor – he was rested at several points over the last 2 seasons and what would make anyone think WC wouldn’t give him a few weeks off flying east every second week. R11 vs GC Suns, R22 vs GWS and about 8 trips to Melbourne for Adam Simpson to let him heal his old man joints. That would be my biggest concern. Enough to make me avoid him in Classic, however… he could be a steal in Draft. As much as I would love to find some round 12 players (I only have one at he moment), Mitch will not be one of them. 22 games last season, that’s pretty bloody good if you ask me! Yeah the rest is always a concern for him, I think however he will have less rests for his “final year playing”. Surely you’d make the most of it! It won’t be his call. The coach will decide whether all the travel is hurting him and if he needs a rest – not Mitchell himself. Sam Mitchell’s biggest relevance in AFL fantasy will be how he influences and affects the other guns in the West Coast midfield – I expect to see a jump from Gaff with more supply, and Shuey could push Premium territory if he’s able to slide to a hybrid inside/outside role while Priddis/Mitchell hold down the fort in the clinches. As some have mentioned, age and resting concerns are too legitimate to consider in AF, in my opinion.